One of the tougher-to-find of all Japanese toy items, Takara's sparse line of 8-inch action figures were large and in charge. Four different figures were produced in this format--Chewbacca, Darth Vader, See-Threepio and a Stormtrooper (misspelled "Stoomtrooper" on the package)--and they're perhaps best known for their odd, almost cheesy appearances. As with many of the old Japanese toys, these figures have a more action-oriented approach than their American counterparts; it really anticipates the robust action figure lines of the late 80's and 90's, such as Mattel's Masters of the Universe. Japanese children apparently demanded more bang for their yen, as just about everything produced there at this time incorporated some outlandish feature, like a firing rocket or a menacing, snarly visage. In this case, the large size is the draw, and it's what makes these figure unique in the realm of Star Wars toys. They are the only mid-size Star Wars action figures every produced. 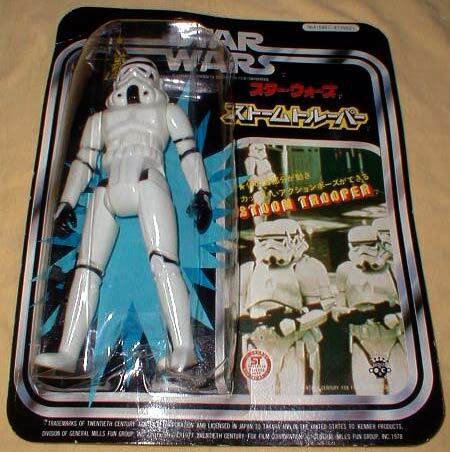 Here you see the Stormtrooper figure-- or Stoomtroopah!, as I imagine Japanese kids of the day liked to call him. Sharp eyes will notice that it's nothing but a scaled-up rendition of the 3 3/4" Stormtrooper figure, likely made using a pantograph device. Even the gun is reminiscent of the one packaged with the smaller toy.